We live in a time when rugged-looking tool watches regularly get paired with formal wear, but then again so do wrinkled work boots, gnarly beards, and worn denim—all of which were once blasphemy at the office or cocktail bar. The Tudor 1926 harkens back to that era when, even if you’d just swum the English Channel or scaled The Matterhorn, you shaved and tuxed up for the evening’s affairs. Meanwhile, your wristwatch—of which you owned just one—needed to withstand rugged adventure while looking downright debonair. I call such timepieces dressy tool watches, or DTWs. For nearly a century, the Rolex Oyster series (e.g. Datejust, Day-Date, etc) has remained the pinnacle of DTW technology and style, and it follows that Rolex’s little brother Tudor would have also excelled in this surprisingly uncommon category. While the bulk of Tudor’s novelties for Baselworld 2018 are vintage-inspired tool watch classics, Tudor’s 1926 series are pure DTW. 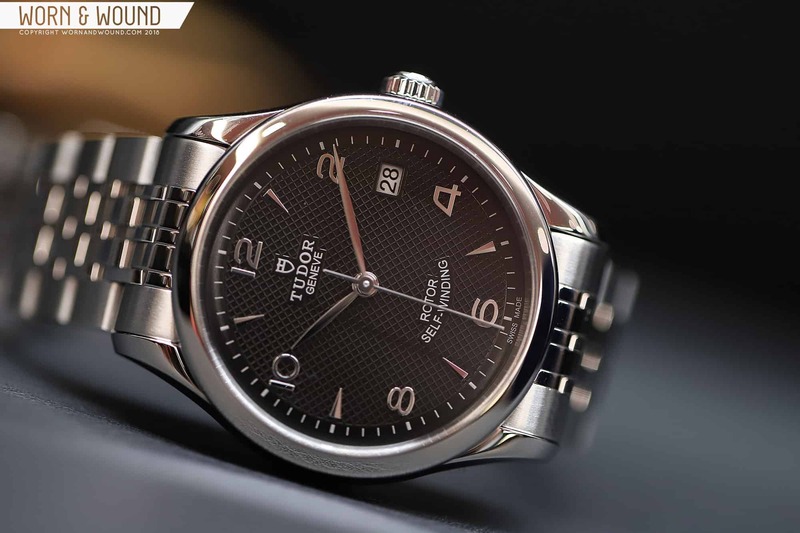 Tudor is boldly marketing the 1926 series to both men and women. To accommodate all wrist sizes and personal preferences, they’re offering the 1926 in 41, 39, 36, and 28mm. Equally gender-bendy is the option to include diamonds in the odd-numeral positions, or not. Add in options like a polished black dial or a waffled silver one, an all-steel or two-tone gold/steel combo, and the 1926 can cover a ton of stylistic ground. Go for the 41mm in all-steel with a black dial and no diamonds, and you’re flirting with a field watch vibe. Bop down to 28mm, a two-tone case and silver dial, and diamonds, and you’re talking grandma driving a convertible to the country club. Smartly, there’s a playful continuum between those extremes along which nearly anyone could find something to suit their tastes. Whatever you choose, it’s the performance of the 1926 that makes them true dressy tool watches. The 100m water resistance, seven-row jubilee-type bracelet, and sapphire crystal mean worry-free swimming (well, I wouldn’t worry, anyway), while both the caliber ETA 2824 (41, 38, 36mm) and caliber 2671 (28mm) tick away with precision and ample shock resistance. All that durability may be hiding in a spec sheet, but many will luxuriate in wearing a wolf-in-sheep’s-clothing rather than advertising their watch’s ruggedness. The 1926 series offers a new entry point for the Tudor line, and, Tudor clearly isn’t targeting in-the-know tool watch fans. But the reserved, dressy aesthetic of the 1926 series is exactly what sets these watches apart in Tudor’s lineup and, ultimately, links the brand back to its roots in an era when the goal was to look elegant while doing rugged things—a stark contrast to the current trend of looking rugged while doing elegant things. At age 7 Allen fell in love with a Timex boy's dive watch his parents gave him, and he's taken comfort in wearing a watch ever since. Allen is especially curious about digital technology having inspired a revival of analog technology, long-lasting handmade goods, and classic fashion. He lives in a one-room schoolhouse in The Hudson Valley with his partner and two orange cats.